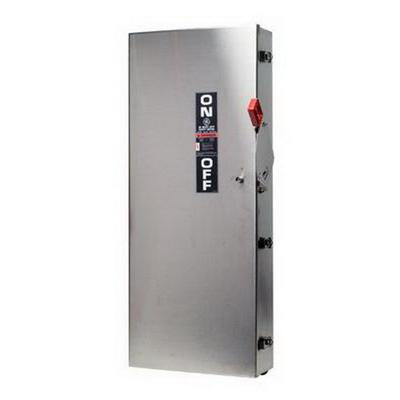 GE Industrial Spec-Setter™ 3-Pole Heavy-duty safety switch is rated at 600-Volt AC and 200-Amps. Non-fusible switch accommodates copper/aluminum conductors of size 2 - 250-AWG. It has maximum load capacity of 60 hp at 240-Volt AC, 50 hp at 480-Volt AC, 50 hp at 600-Volt AC and 40 hp at 250-Volt DC It operates at the frequency rating of 50/60-Hz. Switch has 304 stainless steel housing to withstand daily wear and tear. It measures 35.1-Inch x 14.5-Inch x 5.2-Inch. Switch is suitable for using as service equipment when installed in accordance with the National Electrical Code. It involves quick-make and quick-break mechanism.